With the vacation rental market expected to reach nearly 170 billion dollars by next year, more and more players are getting into the game. Still, in most communities, the short-term rental marketplace is controlled by a few big players, including Airbnb, VRBO, and FlipKey. La Quinta, California, is no different. This small resort community in Riverside County, California, is a key rental spot for Coachella, one of the largest music festivals in the nation. Coachella isn’t the only tourism generator, however, with “snowbird” retiree tourists arriving during the colder winter months to enjoy La Quinta’s year-round warm weather. These tourists enjoy 20 golf courses, including the PGA West, shopping centers, and resorts. La Quinta is ahead of many communities around the nation and has adopted a short-term rental ordinance, likely because of the healthy tourism industry. This ordinance is geared primarily toward peer-to-peer sites like Airbnb and VRBO. 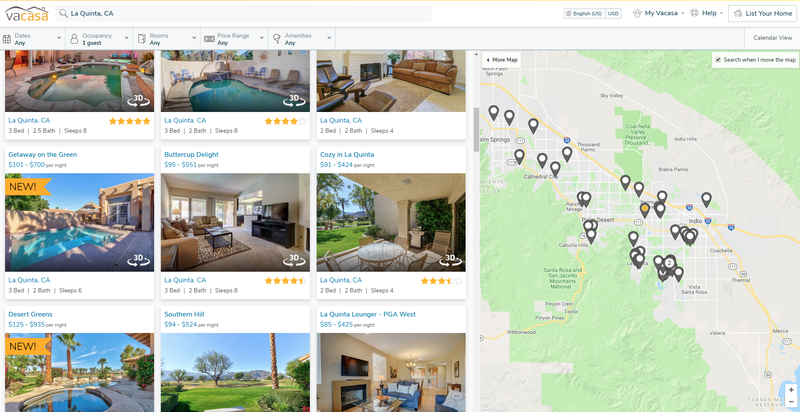 Both Airbnb and VRBO boast over 300 short-term rentals in La Quinta, but total, the community has nearly 1,300 short-term rental opportunities for tourists and come in the form of both single room and entire home rentals. The ordinance also allows for accessory dwelling unit rentals, which is unique to the community compared to others around the country. The registration fees are reasonable, at just over $100, and the tax rate sits at 10%. In the 2016-2017 fiscal year, vacation rental accounted for about $2.3 million of the city’s $8.9 million in transit occupancy tax revenues, according to Finance Director, Karla Campos. The transient occupancy tax captures revenue from “every person desiring to engage in or conduct business as an operator of a hotel renting to transients within the city” including hotels, motels, bed and breakfasts, and home shares. What about Vacation Rental Management Agencies? As more people get into the short-term rental game, they’re looking for creative ways to provide rental services. New on the scene is what’s known as “Vacation Rental Management Agencies.” These agencies aim to capture a piece of the marketplace not currently captured by existing short-term rental players: the sharing economy of non-traditional rental channels with the convenience and professionalism of the hospitality industry. Airbnb also sees this marketplace gap and has jumped on the chance to compete with booking agencies, most notably by their recent acquisition of Luxury Retreats, a 4,000-property full-service villa rental company. For this case study, we picked three of the larger vacation rental management companies to profile and analyze in more detail. The three chosen for this article are Vacasa, Turnkey, and Evolve. So, why might a homeowner choose a booking agency instead of going directly through a home sharing site? Simple: profit and convenience. According to Forbes, the average new Vacasa customer enjoys a 34% increase in profits compared to their former management company in the first year. Much of this is due to the high-tech algorithms and programs Vacasa creates to help owners maximize revenue by learning and automatically adapting to the marketplace as it changes. In fact, most of these vacation rental management/booking agencies provide some level of performance tracking to help improve rental performance and revenue. While many of these vacation rental management companies were founded more than a decade ago, it wasn’t until recently that they caught the eyes of private equity investors and venture capitalists. They’re now sitting on millions of dollars of capital that they plan to use to scale their businesses and capture a more significant share of the 170-billion-dollar vacation rental industry. As mentioned previously, these agencies provide everything from marketing to maintenance to customer service and concierge. Each agency has its website where you can, like Airbnb or VRBO, search for properties and book a stay. Currently, these agencies don’t offer nearly as many listings on their sites as Airbnb or other peer-to-peer sites do, but they’re on the rise. The table below outlines the total listings per state, per company, within five key short-term rental marketplaces. Airbnb and VRBO are still the primary choices for owner/operated short term rental options, with more than 4 million and 2 million listings respectively. In fact, Airbnb facilitated nearly 80 million bookings in 2016 and almost 100 million for 2017. With such a small share of the marketplace compared to other peer-to-peer home share sites, how are vacation rental management companies attracting renters and making their clients such high profits? Well, many of these agencies use the services of peer-to-peer and other booking sites to attract renters. 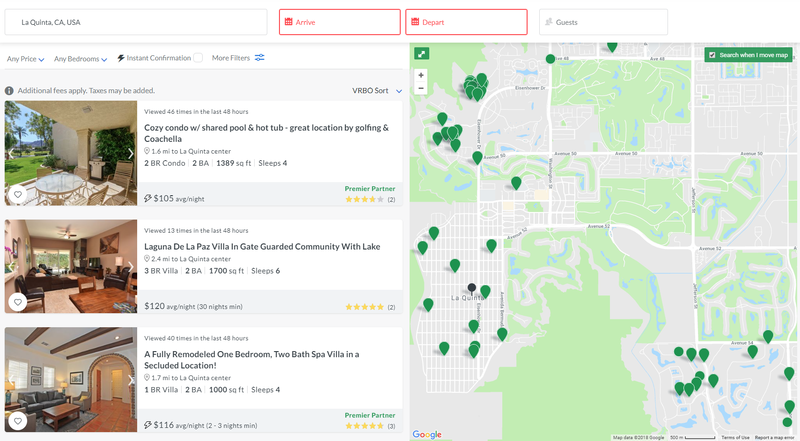 In fact, Vacasa and Turnkey are HomeAway Premier partners, which means HomeAway (and VRBO) spotlights their rentals to attract more renters to these properties. While these agencies use these peer-to-peer sites for bookings, they also provide their marketing and booking services for homeowners. 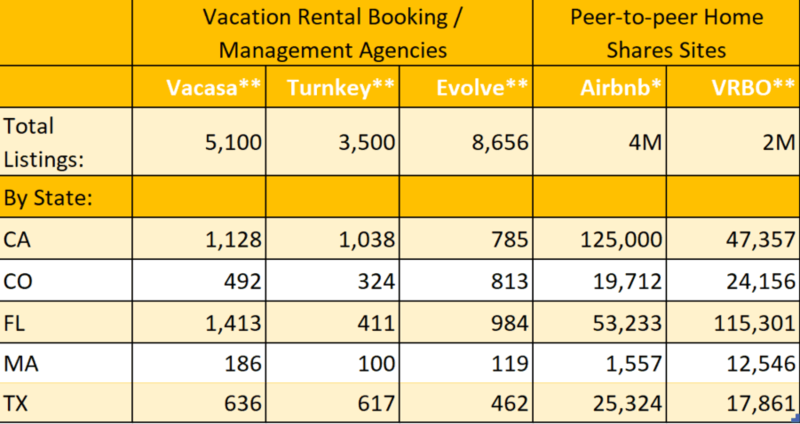 In the City of La Quinta, California, 3 of the top 10 Vacation Rental Management agencies (Vacasa, Turnkey, and Evolve) control 7% of the total short term rental inventory count. Vacasa has 72 rentals, many of which also appear on peer-to-peer home sharing sites like VRBO. A quick study of some of the major short-term rental markets found that vacation rental management sites have a small share of the marketplace, but in more established marketplaces like LaQuinta and Breckenridge, they’re on the rise. This analysis also revealed that the key players differ within different markets. For example, in LaQuinta and Breckenridge, Evolve is the major provider while Stay Alfred dominates Boston and New Orleans. 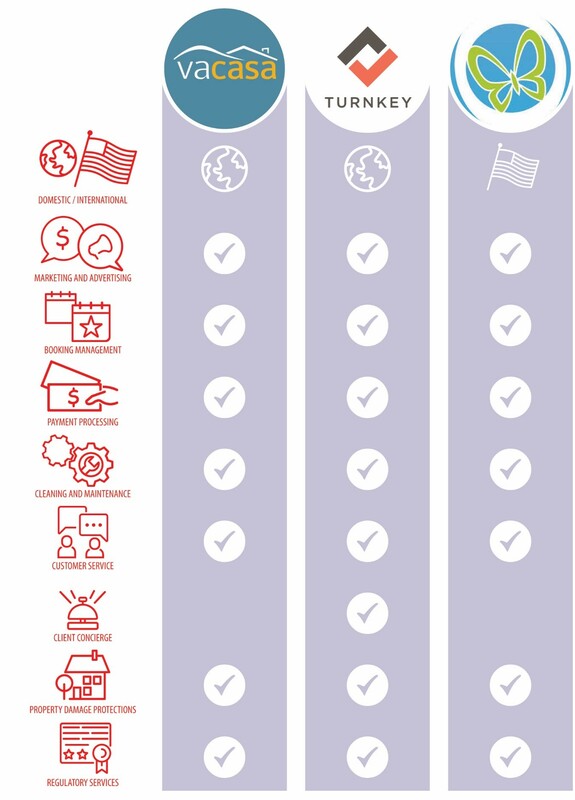 This was done to illustrate that although this review focused on three provider, each vacation rental management site should be monitored because the key players differ in each market. Also, it is interesting to note that in some markets, specifically Boston and Nashville, there are more listings on Airbnb than registered through the municipalities. This, again, supports the use of monitoring software to ensure compliance across all short-term rental platforms. 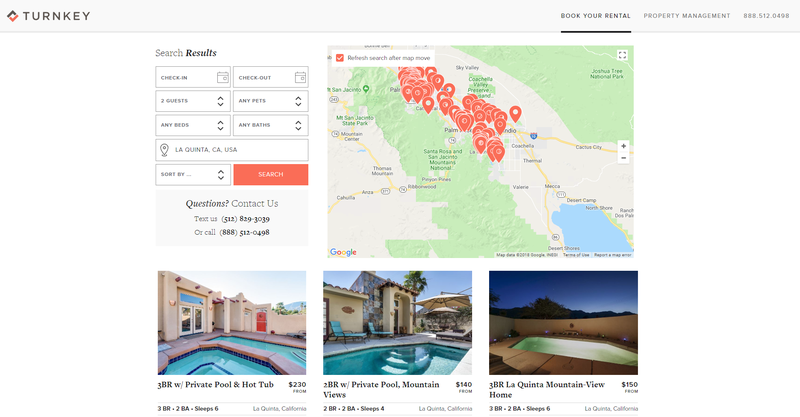 While all vacation rental management sites market that their services including listings on up to 50-some short-term rental and home share sites, a quick review of the websites found that many of the listings showed on one, but not all others. For example, this two-bedroom with private pool and mountain views listing was shown on Turnkey’s website and VRBO but did not appear on Airbnb. This “Cozy in LaQuinta” listing showed on VRBO and Vacasa, but not Airbnb. If their websites boast listing properties on all sites, it makes you wonder even a quick gut-check of a couple properties didn’t confirm this. It also then makes one wonder about the listings on their own rental platforms: Are there listings on Vacasa, Turnkey, Evolve, or Stay Alfred that aren’t on any short-term rental booking site? If so, are these listings even being monitored for compliance? While some of these vacation rental management agencies provide permitting and regulatory services to ensure compliance with local and state laws, not all do. For example, Evolve notes that a property must have “approval from your city and (if applicable) homeowners association to operate your property as a short-term rental.” In other words, they leave the burden of obtaining the business license and permit and remitting taxes to the owner. Other, like Turnkey, provide licensing and compliance services, and even provide local rental compliance monitoring and patrolling, so unruly guests don’t cause violations. One could assume that since they list their properties on the monitored peer-to-peer sites, that one would catch illegal properties. But, for those that don’t provide regulatory services, or for those that may forgo the option as they scale their business, how do you ensure their listings comply with ordinances and regulations? Also, even though they use peer-to-peer sites for marketing and booking, how does one know that all agency listings are being posted through peer-to-peer sites, and not just independently on their home website? Without monitoring each of these sites in addition to the peer-to-peer sites, a municipality may be missing illegal properties and missing out on important hospitality revenues. Founded in 2011, Harmari tools help detect and monitor fraud and criminal activity on online classifieds, e-commerce sites and social media websites. Its flagship product was Harmari Search, which initially helped DMV enforcement agencies combat illegal car dealers on Craigslist, and helped Police investigate stolen property being fenced online. Harmari Search is now used by 150 different law enforcement and government agencies, insurance companies, private investigators, attorneys, cybercrime and other investigative agencies. With the growth of the sharing economy, Harmari Taxcrawler has also evolved to handle short term vacation rentals advertised on websites like AirBnB, Flipkey, HomeAway, and Craigslist. It has proven itself as an asset with a typical 10-25% non-registered discovery rate and over 35,000 short term rental listings under contract to be monitored throughout the US and Canada.